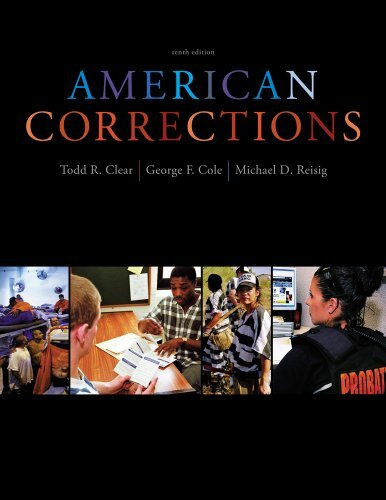 Explore the American corrections system from the perspective of both the corrections worker and the offender in AMERICAN CORRECTIONS, Tenth Edition. Comprehensive yet not overwhelming, the book covers both institutional and community sanctions, incorporating high-profile corrections cases taken from recent headlines to reinforce important theories. The authors "tell it like it is," offering you thought-provoking, unbiased examinations of such topics as assisting felons during the re-entry process, reducing recidivism, the death penalty, and surveillance. You'll also get a frontline view of careers in the corrections field. Todd R. Clear is the Provost at Rutgers University in Newark, New Jersey. He is currently involved in studies of religion and crime, the criminological implications of "place," and the concept of "community justice." He serves as founding editor of the journal Criminology and Public Policy. Previous writing covers the topics of correctional classification, prediction methods in correctional programming, community-based correctional methods, intermediate sanctions, and sentencing policy. Clear has been elected to national office in the American Society of Criminology and the Academy of Criminal Justice Sciences. He has served as a programming and policy consultant to public agencies in over 40 states and five nations, and his work has been recognized through several awards, including those of the American Society of Criminology, the Academy of Criminal Justice Sciences, The Rockefeller School of Public Policy, the American Probation and Parole Association, and the International Community Corrections Association. Clear is the author of three books on community justice: COMMUNITY JUSTICE (Cengage Learning), WHAT IS COMMUNITY JUSTICE? (Sage), and THE COMMUNITY JUSTICE IDEAL (Westview). He is also author of IMPRISONING COMMUNITIES: HOW MASS INCARCERATION MAKES DISADVANTAGED PLACES WORSE (Oxford University Press). Cole, George F., Reisig, Michael D., Clear, Todd R.